HBO’s Game of Thrones season seven begins its shortened run with episode one airing July 16, 2017. The previous six seasons premiered in late March or April, but Game of Thrones fans were forced to endure a much longer wait for the debut of the seventh season. Let’s hope the wait for this seven episode season has been worth it. Season seven’s first episode, “Dragonstone,” begins with Walder Frey (David Bradley) calling his men to order. Every Frey is gathered in the dining room and wine is distributed so they can toast to the family and to heroes. Glasses are raised, the toast is made, and everyone except Walder and the girls in the room drink. He acknowledges they’re the men who helped slaughter the Starks and recalls they butchered a pregnant woman, a mother of five, and slaughtered all of their invited guests. “But you didn’t slaughter every one of the Starks,” says Walder. Of course, this isn’t Walder but is in fact Arya in disguise. The men drop dead from the poisoned wine as Arya (Maisie Williams) rips off the Walder mask. Arya tells the girls she left standing to inform everyone the North remembers and that winter came for House Frey. Arya, satisfied with her work, walks through the dead men and out of the castle. Cold winds blow over a field as the White Walkers slowly advance. Winter snow swirls around them and even Wun Wun is with the horde. Bran Stark (Isaac Hempstead Wright) and Meera Reed (Ellie Kendrick) make it to the gate at the Wall, and Bran reveals the Night King is coming for them all. Eddison Tollett (Ben Crompton), now Lord Commander of the Night’s Watch, allows them through the gate. Meanwhile, Jon (Kit Harington) has gathered the families of the North and asks everyone to look for dragonglass because it will be needed to kill the White Walkers. He also declares women and boys need to learn to fight since everyone will have to pitch in to survive this upcoming battle. Lady Lyanna Mormont (Bella Ramsey) readily agrees, saying they’ll train everyone on Bear Island. Jon says the Wall needs to be better defended and Eastwatch-By-The-Sea is the first castle that needs to be reinforced. Tormund Giantsbane (Kristofer Hivju) steps up and agrees he and his wildlings will protect that castle. A debate rages over whether the Umbers and Kastarks should lose their castles because they fought against the Starks. Sansa (Sophie Turner) is of the opinion, which is well received, that those who remained loyal should take charge of the Umber and Kastarks castles, but Jon doesn’t agree. He has no desire to punish sons for their fathers’ sins and won’t take family homes away. He declares this is his decision and it’s final. Jon calls out young Ned Umber and Alice Kastark and they move forward in the crowd. He asks them to pledge their loyalty to House Stark and they immediately do so. “Yesterday’s wars don’t matter anymore,” says Jon, adding that everyone needs to band together to win this war. After the meeting, Jon and Sansa have a heated discussion about arguing in front of the men. She mentions Joffrey’s leadership style and Jon takes offense. She soothes his anger by saying he’s far from Joffrey and is a respected, natural leader. They discuss their father and Sansa reminds him their dad couldn’t protect her and neither can he. She says both Robb and her father made stupid mistakes and lost their heads. Sansa suggests it wouldn’t be a bad idea if he actually listened to her. A raven arrives with a message from Queen Cersei. Cersei demands Jon come to King’s Landing and bend the knee or else. Sansa believes they need to take care of Cersei, but Jon wants to devote all of their attention to taking on the Night King. Sansa warns him not to underestimate Cersei, admitting she learned a great deal from her while at King’s Landing. Jaime (Nikolaj Coster-Waldau) and Cersei (Lena Headey) examine a map of the world painted on the floor. She wonders why Jaime’s been quiet since he returned, and even asks if he’s afraid of her. She talks about Daenerys Targaryen naming Tyrion as her Hand. 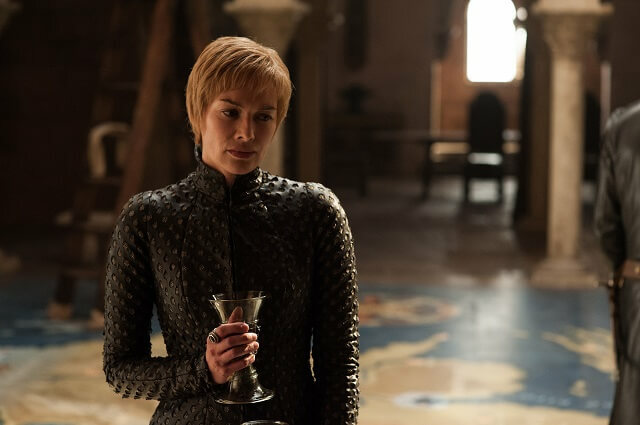 Cersei’s angry her traitorous brother gives their enemies counsel and asks Jaime where he thinks Daenerys’ ships will land. Jaime is convinced it will be Dragonstone. Cersei walks around the map, listing all of their enemies. “We can’t win a war if we can’t feed our men and our horses,” says Jaime. He reminds her the Lannisters are viewed as being the losing side of this battle and no one will come take their side. He doesn’t understand why she cares about launching a dynasty when all of their children are dead. When Jaime asks to talk about Tommen, Cersei abruptly declines. She doesn’t want to discuss their dead children since she and Jaime are the last Lannisters that count. Jaime expresses concern over their lack of allies. He doesn’t know who just killed the Freys, but is upset over the loss of those allies. Shortly thereafter, Cersei reveals she’s invited Euron Greyjoy and his army to King’s Landing. She and Jaime watch Euron’s ships arrive and Jaime questions why she thinks they could possibly count on the Greyjoys. “I know the Ironborn. They are bitter, angry little people,” says Jaime. Then Cersei delivers the shocking news that Euron is coming because he needs a queen. Euron Greyjoy (Pilou Asbaek) speaks in the great hall, describing the treason he endured at the hands of his niece and nephew. He wants to join with Cersei since her family has also committed treason against her. Jaime points out Euron started a rebellion and burned the Lannister fleet. They exchange barbs and then Euron compliments Jaime on cutting down Greyjoys. If his family wasn’t crushed, then Euron wouldn’t now be the greatest captain of the seas. Euron reminds Cersei she doesn’t care about the Iron Islands but does care about the Iron Fleet. With it, she can own the seas. In exchange for 1,000 ships, he wants her hand in marriage. She declines his proposal because he’s not trustworthy. She knows he murdered his own brother and Euron suggests she should murder hers. “It feels wonderful,” declares Euron. He says the surest way to her heart is with a priceless gift, so off he goes to get it. He won’t return until it’s in his possession. Samwell Tarly (John Bradley) is handling Citadel janitorial duties, emptying bed pans and obviously not happy about this particular time in his life. His days are repetitive and endless. He longs to read a book that’s kept locked away out of his reach, even attempting to read it from behind its locked gate. Sam waits until nightfall and steals the keys to the restricted area. Brienne (Gwendoline Christie) gives Podrick (Daniel Portman) a sword lesson while Tormund watches. He’s still interested in Brienne, calling Podrick a lucky man. Littlefinger (Aidan Gillen) and Sansa watch Brienne and Podrick from above, and Littlefinger says he just wants Sansa to be happy and safe. She claims to be safe because she’s home with friends, but it’s obvious she’s not happy. Brienne interrupts their conversation and Littlefinger scurries away. Brienne wants to know why Littlefinger’s still there and Sansa reminds her they need his men. They would have lost without the Vale’s men. Arya comes a group of men singing, led by Ed Sheeran! She pauses to tell them it’s a pretty song and they invite her to share their rabbit. Arya examines them closely as she takes a seat with the group, revealing she’s heading to King’s Landing. This group is off to help keep the peace because of what happened at the Freys, and Arya asks them about their adventures. They confess they just want to get home, and one soldier says his wife just had a baby and he hopes it’s a girl. They offer her a drink of blackberry wine and she compliments the man who made it. They finally ask why she’s heading to King’s Landing and she replies, “I’m going to kill the Queen.” The men laugh and Arya joins in. Thoros of Myr (Paul Kaye) and the Hound (Rory McCann) talk about what a horrible night it is to be out on the road. They come across a house in the middle of nowhere and the group decide to spend the night since it looks deserted. The Hound reveals he doesn’t like the look of it (it’s the house where he killed the family while he was with Arya), but the men enter the building anyway. A discussion takes place as to how the people inside died, but the Hound doesn’t give anything away. The Hound and Beric Dondarrion (Richard Dormer) talk about how long they’ve known each other, and the Hound admits he doesn’t hate him. He does, however, wonder why the Lord of Light keeps bringing Dondarrion back since he’s not the best man. Dondarrion admits he asks himself often why he’s still living and what the lord sees in him. He’s never received an answer. The Hound says it’s just his luck he ended up with a band of fire worshippers, but Dondarrion thinks it’s divine justice. Thoros tells the Hound to look into the flames if he wants to know how Dondarrion was brought back to life. The Hound does and has a vision of a wall of ice. The Wall of ice, to be precise. Where the Wall meets the sea there’s a castle, and then the vision shows him a mountain that looks like an arrowhead with the dead marching past. He sees thousands of White Walkers in the flames. “Do you believe we’re here for a reason?” asks Dondarrion after the Hound describes what he saw. The Hound buries the dead from inside the house and Thoros asks if he knew them. The Hound replies, “Not really,” as he and Thoros finish burying them. The Hound begins to say a prayer over the grave, telling them they deserved better. Sam studies the stolen book as Gilly (Hannah Murray) and Little Sam sit nearby. Gilly tells him to get some sleep but then picks up a book. Sam explains the Targaryens used dragonglass to decorate their weapons without even knowing its true value. Sam then finds a map of Dragonstone and gets excited when he discovers it shows a mountain of dragonglass. He immediately pens a message to Jon. Back at his normal duties the following day, an arm reaches through the small opening in a door as Sam goes to empty a bowl. The arm, covered in greyscale, belongs to Jorah Mormont (Iain Glen). He asks if Daenerys Stormborn has arrived yet. Dany (Emilia Clarke), Tyrion (Peter Dinklage), Lord Varys (Conleth Hill), and Missandei (Nathalie Emmanuel) stare at the shore as the dragons fly ahead to land. A small boat delivers Dany to the beach where she walks ahead and then kneels to touch the sand. She looks up at the castle and then makes her way to the massive stone dragon heads guarding the closed gate. The gate is pushed open and Daenerys Targaryen has officially arrived at her ancestral home.